Waverly Station, is at the east end of Princes Street. Trains from Londons King's Cross Station takes between 4 and 5 hours and there are comprehensive train connections from most cities in the UK. There are two taxi options when you get to Edinburgh Airport. You can pre-book an Edinburgh City Private Hire car on 0131 555 5555. Or you can pick up a black cab at the rank on the ground floor of the multi-storey car park. The Airlink 100 express is the fastest. The N22 night bus (£3) and The Lothian Bus number 35 (£1.50) runs into city centre but calls at local destinations en route, and continues to Leith. 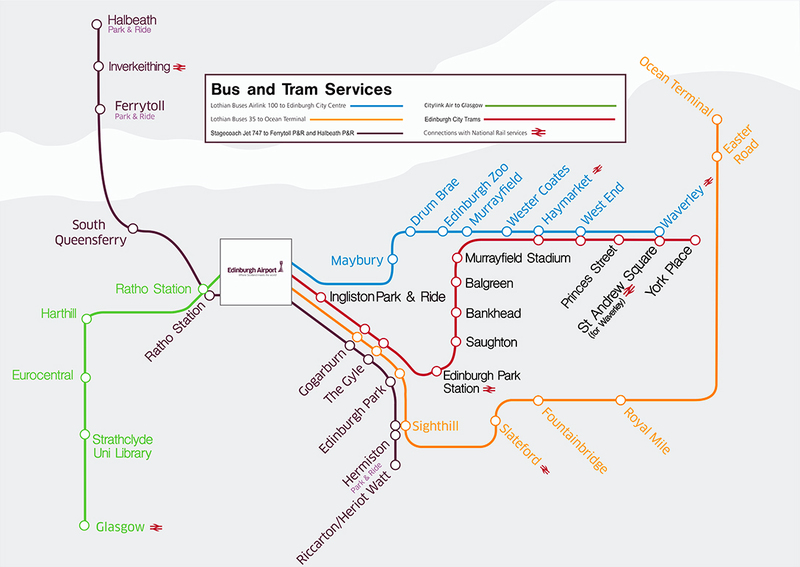 This express bus service runs from the airport to Waverley Bridge (near Princes Street and the main rail and bus stations). Tickets can be purchased from the ticket machines at the tram halt.